Earlier this week Nintendo announced a new addition to it’s hand held family. 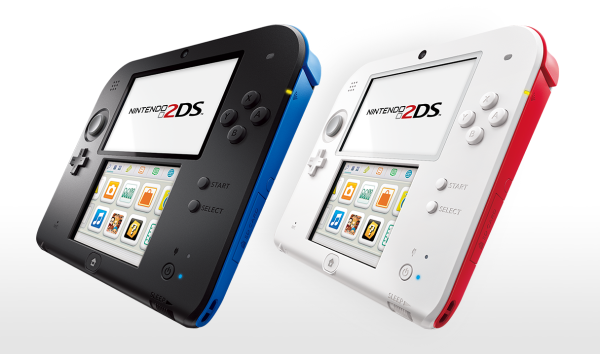 The Nintendo 2DS, the child friendly alternative to the popular 3DS. The new Nintendo 2DS system gives you all the features of the Nintendo 3DS and Nintendo 3DS XL, minus 3D viewing and the price makes the world of Nintendo games even more accessible. The 2DS is compatible with all Nintendo 3DS and most Nintendo DS games; has wireless connectivity for multiplayer and co-op play and has access to the Nintendo eShop, with digital games, free demos, and special offers. The 2DS has a similar design to the 3DS with the dual screens but it has no hinges. This is to help the console last in the hands of over excited children who may have trouble with the hinges of the 3DS. It will be available in “White + Red” or “Blue + Black” from 12th October, the same day Pokémon X and Pokémon Y comes out. Nintendo of Europe doesn’t set the price of hardware in the UK, but GAME has set its price as £109.99. Train2Game has discovered that Nvidia just announced Project Shield, a new gaming console that looks like a controller attached to a 5 inch HD screen. The new hand held console runs on the Android operating system but what sets it apart from the other android platforms is that it has a controller similar to a current console controller for ease of use. Project Shield is powered by a custom 72-core Nvidia A15 GeForce GPU and features a 5-inch 720p retinal multi-touch display, integrated speakers, wi-fi connectivity and the Android operating system. It’s also designed to interface as a controller with an Nvidia GPU-equipped PC, allowing you to play games from your couch. 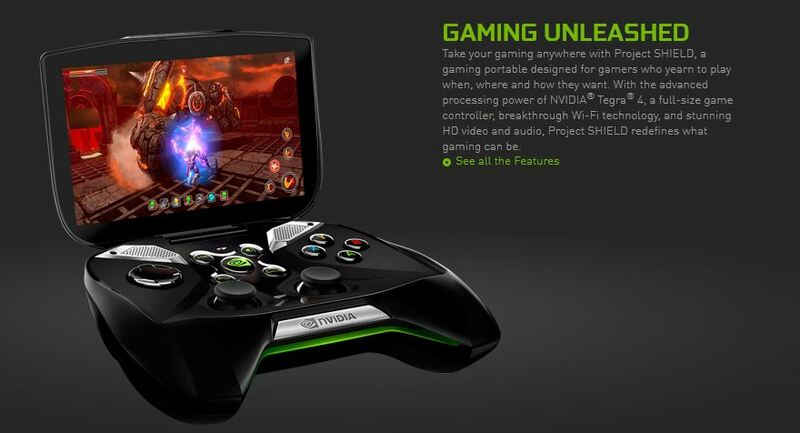 The Android gaming platform seems to be a big player in 2013 with the OUYA games console, the recently announced GameStick and now Project Shield from Nvidia. The Train2Game blog has previously reported on cloud gaming, and how some believe it’s the future of the games industry. 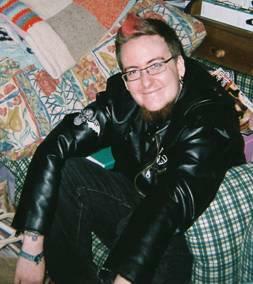 However, owner of cloud gaming service Gaikai Dave Perry – who has previously been quoted by the Train2Game blog – doesn’t believe cloud is a threat to consoles. He think the threat to those comes from somewhere else. And while Perry believes games consoles like the PlayStation 3 and Xbox 360 could survive thanks to their ability for use as multimedia entertainment devices, he’s not so sure about traditional handhelds. Perry’s comments echo those the Train2Game blog reported Capcom made at the beginning of this year. They argued that smartphones including the iPhone are dragging consumers away from traditional handheld consoles. And as reported by the Train2Game blog earlier this year, Apple could ‘own’ the games industry, at least according to Former PlayStation executive Vice President Phil Harrison. As Train2Game students will know, the iTunes App store could potentially provide a Train2Game student with a large audience for the games they produce. 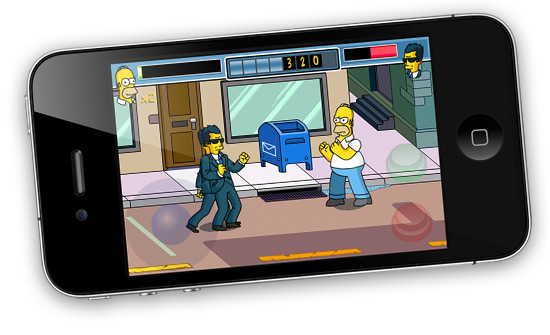 So Train2Game, is Apple the biggest threat to the rest of the games industry? Should it be considered a threat at all? It’s entirely possible that some Train2Game students could end up developing games for the upcoming PlayStation Vita in future. At least that’s the case if one or more students end up working for an indie studio looking to develop on the handheld console. Indie studio Rubicon has confirmed to Gamasutra that Sony are handing PlayStation Vita dev kits to small game developers. “I can confirm that Sony was generous enough to loan us some kit, and that’s one of the many reasons why I big them up every opportunity I get.” said Managing Director Paul Johnson. Last month the Train2Game blog reported that Sony wanted to see more support for indie developers. As an industry, we have to support those smaller teams, and let them try out their ideas, without doing so, the whole industry will stall, in terms of innovation.” Said Sony Computer Entertainment Worldwide Studios boss Shuhei Yoshida. The PlayStation Vita – previously known to Train2Game blog readers as the NGP – featured prominently in Sony’s E3 conference. For more information about the PlayStation Vita, see the full report on the Train2Game blog. So Train2Game, is it a positive move that Sony are loaning dev kits to indies? Would you like to develop for a handheld such as the PlayStation Vita in future? Good news for the Nintendo fans among Train2Game students! The Japanese giants are set to reveal launch plans for the Nintendo 3DS at a launch event in Amsterdam next month. MCV Online report that invitations to the gathering have been sent out to the press, and suggest that Nintendo will reveal a European launch date and price for the 3DS, along with a launch line up. 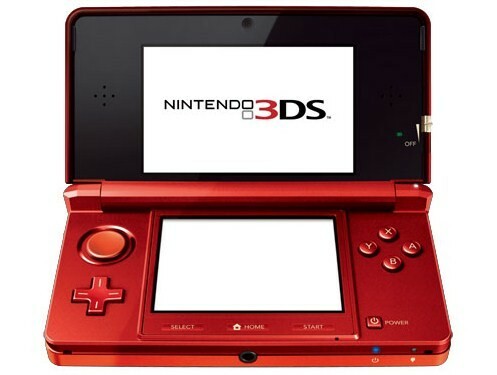 The Nintendo 3DS is not only the world’s first 3D handheld console, but it also offers the chance to play games in 3D without the need for special glasses. Train2Game students who wear regular glasses are no doubt pleased about this! The Nintendo 3DS will be available in Japan from February 26th 2011, with a European release date expected to be in March. If that is the case, it’ll mean eager Train2Game students should be able to resist importing a 3DS from Japan! There are no official launch titles yet, but earlier this year Nintendo revealed a software trailer that shows a wide variety of 3DS games in development. Big name titles include Super Street Fighter IV DS, Metal Gear Solid Snake Eater, Dead or Alive Dimensions, and Mario Kart 3DS. This morning CVG has reported that The Sims 3 will also be coming to Nintendo’s handheld. You can see the Nintendo 3DS software line up video here on the Train2Game blog. While we have no official confirmation of what the launch titles will be, though this is likely to change after the Nintendo event! You can check out the Thoughts of Train2Game blog to see which games Gabe believes will be available with the Nintendo 3DS at launch. Of course, all will be revealed on January 19th. Earlier this month on the Train2Game blog, we reported on how handheld consoles are losing the mobile gaming market to smartphones. Could the Nintendo 3DS help slow down this trend? So Train2Game, do you want a Nintendo 3DS? Are you looking forward to the announcement? And which games do you expect to be launched with the handheld console next year?